Another great office property leasing web site by VISIONEFX. Features a pop-out inquiry form for quick customer interaction. The property website is an original custom Word Press design. The website also features an interactive photo galleries and downloadable information. 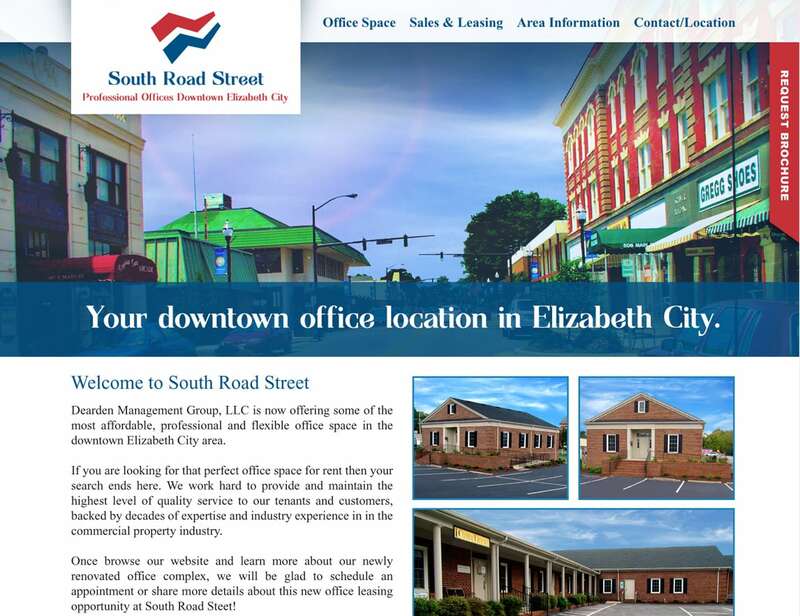 South Road Street has offices in Elizabeth City NC and Virginia Beach. When searching property web design look no further than the VISIONEFX your property web design, development professionals. A custom property website provides business owners a branded website presence in a highly competitive space. Call the online branding web design experts at VISIONEFX. We provide web design North Carolina. VISIONEFX, a Web design company based in Virginia provides custom web site services to businesses owners throughout Virginia and the USA. Services include advanced Word Press web design, eCommerce sites and Moodle website development. We also provide Word Press customization, Open Cart design, Joomla design, Search engine optimization and web maintenance services. For more information about our services call VISONEFX at (757) 619-6456 or email direct to info@visionefx.net. See our Top Google Reviews posted on Google My Business pages. Read our review and contact our website customers and learn why our web maintenance services are second to none.